Naposim is a strong anabolic and androgenic product, and most often produces dramatic gains in size and strength. It has been called, "the breakfast of champions" by Arnold . It also increases endurance and glycogen retention. It is a derivative of testosterone, and is an extremely fast acting oral. It has terrific effects on the protein metabolism, and promotes protein synthesis, which supports the buildup of protein. This creates a positive nitrogen balance which is good for your overall health. An important reason why Naposim works so well is that the endogenous cortisone production is reduced by 50-70%. It is probably the best choice for a bulking cycle. 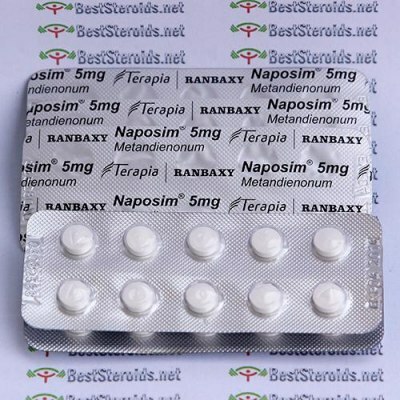 This is not a steroid that you would want to use for cutting, but only to increase size and strength. A week gain of 2 to 4 pounds per week during the first 5 to 6 weeks is normal. The additional body weight comes from an increase in tissue (hypertrophy of muscle fibers) and water retention. Women should not use Naposim because of it's androgenic component. With a combination of Nolvadex and Proviron, the aromatizing effects will be minimized. After discontinuing intake, 3 to 4 days, proof of the substance in the blood is negative. It has great effect for my gains, but also a lot of sides like water and aggressiveness. I use it with Sustanon in my cycle, but soon will take some antiestrogens, before i kill someone lol. my strength gains were awesome. Excellent product pumps are amazing! real stuff for the real athlete HUMAN GRADE. put on 17 pounds in 6 weeks. Good dianabol put 14 pounds on in about 4 weeks 50mg per day but I only kept 7. Strong pumps, vascularity and fullness. High quality dbol. HUMAN GRADE. Ran a few of these bad boys on a cycle. just WOW. loved every minute of it. pumps were unreal like 5 mins into warmup sets. Will run arimidex next time I run these which I plan to on my upcoming cycle. just made my 4th order last week. costumer for life. I will be making plenty more orders in the near future. I already have 2 of my friends using napos alongside test-e.